There has been a tradition ongoing in Coventry since 2003 to say the Rosary on Friday’s during Lent, May and October in the city centre. The group meet at the statue of Our Lady of Coventry located in Priory Gardens, Broadgate. Everybody is welcome and the rosary starts at 1.40pm and lasts for about 20 minutes. The group was started by the Justice and Peace Group from St Thomas More, Coventry. The statue of Our Lady of Coventry is located in the nave of ruins of St Mary’s Priory and Cathedral that date back to the 12th Century, and were destroyed during the Dissolution of Monasteries in the early 16th Century. The statue was a gift to Coventry to mark the millennium in 2001, was and sculpted by Sister Concordia Scott a Benedictine nun. Last Friday (29th March) the group prayed the Sorrowful Mystery, and prayed for those involved in many of the ongoing conflicts throughout the world. The group also pray for special intentions. If you have 20 minutes it’s a lovely way to finish the week. 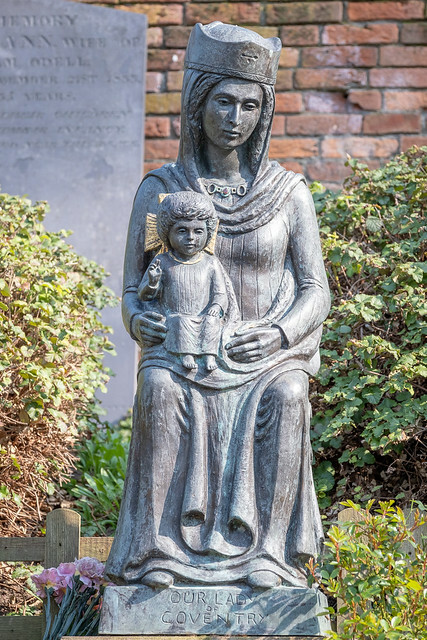 The photographs show the statue of Our Lady of Coventry as well as the group that met.